Stamp with Kathya: Nacho Gold! Happy Nacho Tuesday Stampers! Hope your last week of 2014 is going great! Wishing you and your family all the best for 2015! It's been a fun year but I'm ready for new beginnings and new challenges! What about you? What are you looking forward to in 2015? 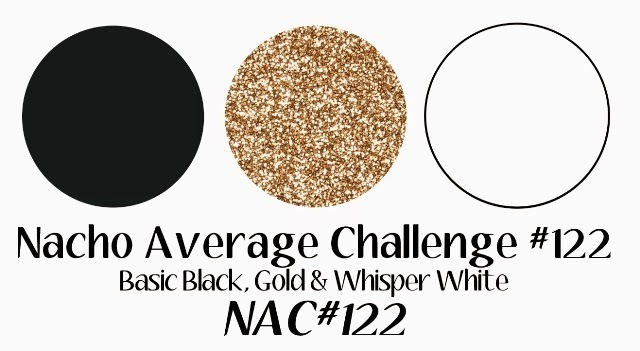 We have an awesome Nacho Average color challenge for you today! Hopefully it'll get you in the festive mood and help ring in 2015. We hope you will join us, we love seeing you creations. I inked up a new stamp set which is in the upcoming 2015 Occasions Catalog, which goes lives on Tuesday, January 6, 2015. Can't wait for next Tuesday! Lost of amazing new stamp sets, DSP, embellishments! Just wait until you see it! The stamp set is called Hello Life. The DSP is retired but black and white continues to be one of my favorites and I might as well use up what I have. Well friends, hope you have a great week! Thanks so much for stopping by today! Happy New Year!